You come across a Bluetooth Speaker that has 1000+ customer reviews on Amazon, along with an excellent star rating and price of just $50. It’s hard finding a wireless speaker; under such an affordable price range that can give sound output of 20W, which is more than enough to fill a large room. We’re talking about Aomais Sport II Bluetooth Speaker and this is my Aomais Sport II review from my personal experience. 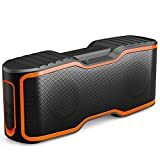 There are plenty of things to consider before buying this portable Bluetooth Speaker and once you go down, you’ll realize if the Sport II Bluetooth Speaker from Aomais is for you or not. Without wasting much time, let’s get into the meatier parts of this post. Coming to the box first, for the price; it’s very decent and (the box) does give a feeling of being made in a cheap factory in China. Opening the box, inside is the big speaker, which to my surprise is quite heavy, however feels sturdy and is build to last long. Other things you’ll find are AUX cable, USB charging cable and a custom-made floating accessory that can be inflated to keep the speaker on it and float on water. Keeping everything aside, the speaker is very comfortable to hold; thanks to the rubberized material used on the sides, top and bottom of the speaker. Available in two colors: Orange and Green, you can find the color accents along the front and side of the speaker, while the rest of the speaker is black. For an additional $10, you can get this cool looking Sling cover for Aomais Sport II and use it as a portable boombox. Use this code ‘OBCLOE7Z’ for an additional 10% discount while buying the Sling Cover. I love products that have a functional design, and similar is the case with Aomais Sport II. Since it’s a complete outdoor and Waterproof Bluetooth speaker, you can see it has a ridge around the centre, which makes it easy to hold without blocking the speaker drivers. Moreover continuing the functional design, you can see it has good quality rubber edges that offers solid grip. Additionally this speaker has an ability to float on water (I’m not kidding, see the video), hence even if you accidently drop it in a pool or bucket, don’t worry the speaker will come floating on the surface of the water. Durability wise, there’s no comparing the Aomais Sport II with any other speaker in the price range. This speaker is as rigid as it can get, and the guy at Hifi Heaven ran a car over the speaker and nothing happened to the speaker at all. Design wise, the Aomais Sport II is very functional as well, however it may not be a desirable option for someone looking for something fancy or flashy. At the top of speaker, you get few buttons like Power On/Off, Volume Up and Down, Forward, Back, Play/Pause and Call Receive/End button. Just next to it are 3 LEDs that notify about Power Status, Battery and Bluetooth. On the left side, you can see a removable rubber flap that houses the AUX port and micro USB port for charging. However do make sure the rubber flap is completely closed before drowning the speaker in water. The front of Aomais Sport II features two drivers on either side that have the ability to produce 20W of sound output combined. The back however hosts passive radiator for easy flow of air. To be honest, if this speaker was from any premium brand like JBL, Sony or Bose, it wouldn’t have costed less than $150. Since it’s a wireless Bluetooth speaker; meant to be used outdoors, you get a really great and rugged built quality, a rubberized casing and base; so as the speaker can sit easily even on rocks and uneven surfaces. Moreover happens to have a very loud sound; for it to be audible in noisy outdoor environments. Not only will the Aomais Sport II make a good buddy when you’re river rafting through a valley but also during campfire; when you require slow-paced music played in the background. Indoors, this speaker sounds like a bomb, with little to no distortion upto 70-80% volume. With THD of less than 1%, you can expect sound quality similar to a full sized desktop speaker. Battery life on the other hand is very good, with a recharge time of 3 hours, you get upto 10 hours of playing time, however I’d recommend charging via a wall charger for faster charging. For ease-of-use, you get voice prompts, which start up when you switch On/Off the device and when it’s paired/disconnected via Bluetooth. Connectivity via Bluetooth was solid as well, and no issues of signal dropping or songs skipping if the smartphone is kept at a reasonable distance. For a price of just $50, not only does the Aomais Sport II features Bluetooth and Aux as connectivity sources, but it also includes NFC connectivity for just one touch connection. Magically the speaker can float on water and keep playing too, however it can also stay inside water till a depth of 1m and as long as upto 30 minutes. Additionally, you can also pair the Aomais Sport II with another speaker and enjoy a very loud 40W sound output. As you saw, Aomais Sport II is a complete feature packed Bluetooth Speaker that should be your ideal companion if you plan frequent outdoor activities. However do keep its weight of 21.7 ounces in mind, which I believe is the only con of this speaker, incase you’re traveling with the speaker. What else more could you ask from a sub-$50 Wireless Bluetooth speaker that provides sound output of 20W, NFC, IPX7 Certification, floats on water, rubberized casing, does not disintegrate even with a car running over it and stereo sound as well. If the Aomais Sport II didn’t please you for being a Bluetooth Speaker under $50, I don’t know what else would. If you like the review, please do consider sharing it with your friends on social media sites like Facebook, Twitter and Google+.